TWO well-known contemporary rabbis. Two prolific authors. Two personal journeys. One Rebbe. And a remarkable legacy that just keeps growing. Rabbis Joseph Telushkin and Adin Even-Israel Steinsaltz have come out with new volumes on the Rebbe, Rabbi Menachem Mendel Schneerson, 20 years after the death of the Chabad-Lubavitch Chasidic movements seventh leader. Telushkin’s father, Shlomo, worked as an accountant for both the seventh Rebbe and his predecessor. When he was left paralyzed and disoriented by a stroke, Shlomo got two phone calls each day from the Rebbe. One day, the Rebbe’s secretary, Rabbi Yehuda Krinsky, conveyed an accounting question from the Rebbe for Shlomo to answer — and he answered successfully, despite being ill.
“I was very profoundly moved because I realized what happened was, the Rebbe was sitting there in Brooklyn, dealing with all these major issues, and he could empathize with the situation of my father, who suddenly had his whole life turned upside down and probably was feeling quite irrelevant, and the Rebbe was sort of bringing him back into the world,” Joseph Telushkin said. That story, also included in the introduction of Telushkin’s Rebbe (published by HarperCollins), is emblematic of the anecdotes infused throughout the 640-page book, providing a history of the Rebbes hallmark focus on the individual  from heads of state to the everyman. Released June 10, the biography is the result of hundreds of interviews and unprecedented access to other interviews from Jewish Educational Media, Chabads video archive and multimedia arm. “It was not easy to write a biography because the Rebbe was very unrevealing, didn’t talk about himself much, and didn’t leave behind many documents about himself, so I had to construct a biography to a large extent on peoples interactions with him,” said Telushkin. Three nights a week, starting at 8 p.m. and lasting until the early hours of the morning, the Rebbe would hold one-on-one meetings called yechidusen (singular, yechidus). While Telushkin details many yechidusen, he devotes special sections to the Rebbes meetings with philosopher Yitzchak Block; Yehuda Avner, an adviser to four Israeli prime ministers; novelist Harvey Swados; and Chana Sharfstein, who came to consider the Rebbe as a father figure after the murder of her own father when she was a teenager. ”I realized, this is a very unusual phenomenon, of a man who led a worldwide movement, and yet who always was able to remain very focused on the individual,” Telushkin said. Who else might be in the running for most well-known rabbi? 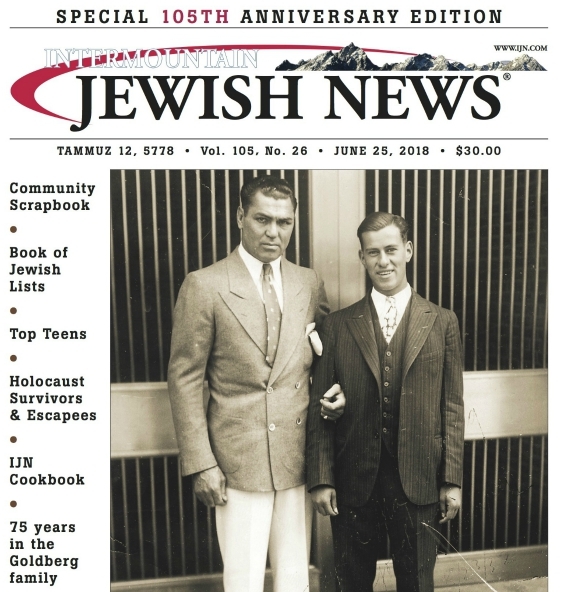 “The Reform movement’s Rabbi Stephen S. Wise might be the most famous US rabbi of the first half of the 20th century, and there are two prominent synagogues named for him, yet the percentage of American Jews who know much about him is small,” Telushkin said. WHILE Telushkin opted for Rebbe, he said Steinsaltz had the right to use the title My Rebbe (published by Maggid Books) because of his personal relationship with Schneerson. Like Telushkin, Steinsaltz — who has written 60 books and is best known for his translation of the Talmud from Aramaic into modern Hebrew — did not specifically write his book for the Rebbe’s 20th yahrzeit. He explained that My Rebbe, released May 1, took many years to complete and that it was almost by chance that it came out now. ”It was, emotionally and intellectually, a very hard job,” Steinsaltz said. An alternate title to the 250-page book, he said, could have been Father, Teacher, King — the roles any rebbe plays in the lives of his followers. Writing on the topic of miracles, Steinsaltz explains that the Rebbe performed what might be considered modern-day miracles through his ability to perceive things others could not. He said that while biblical-era miracles were impressive, they didnt change much. The Jews crossed the Read Sea with Moses, and a few days later they had enough chutzpah to complain about him, Steinsaltz noted — but those who met the Rebbe often truly internalized the encounters and changed their behavior. WRITING Rebbe was personally transformative for Telushkin. For instance, the Rebbe, due to his emphasis on using optimistic language, would refer to a hospital in Hebrew as beit refuah, meaning house of healing, rather than the widely used beit cholim, meaning house of the sick. Telushkin, likewise, said he now refrains from using the word deadline for a project because it connotes death; he now uses due date, which ironically connotes exactly the opposite  birth. “While the Rebbe’s legacy is certain to be a topic of debate amid the 20th anniversary of his death, he actually left marching orders rather than a legacy,” Steinsaltz writes in My Rebbe. “Many Jews have all kinds of books that are theoretical books to rely on, or to refer to, but that is not always something that makes people move in the same direction,” Steinsaltz said. When the Rebbe became ill in the years before his death, people started to wonder about the continuity of the Chabad movement  but these doubts have been put to rest and then some, and according to Telushkin. ”Instead [of Chabad being weakened], during the last 20 years, Chabad has tripled in size, it’s now in 80 countries, there are Chabad houses in 48 of 50 American states,” Telushkin said.